The Bryston SP4 home cinema processor provides a choice of RCA and XLR analog outputs, as well as seven HDMI 2.0 inputs, dual HDMI outputs that include an HDMI 2.0 output, network connectivity and digital inputs for legacy components. Many companies talk a good game, but few companies can back up the talk like the Canadian manufacturer Bryston. Bryston’s gear is found in recording and post-production facilities across the world, as well as some of the finest home theaters. 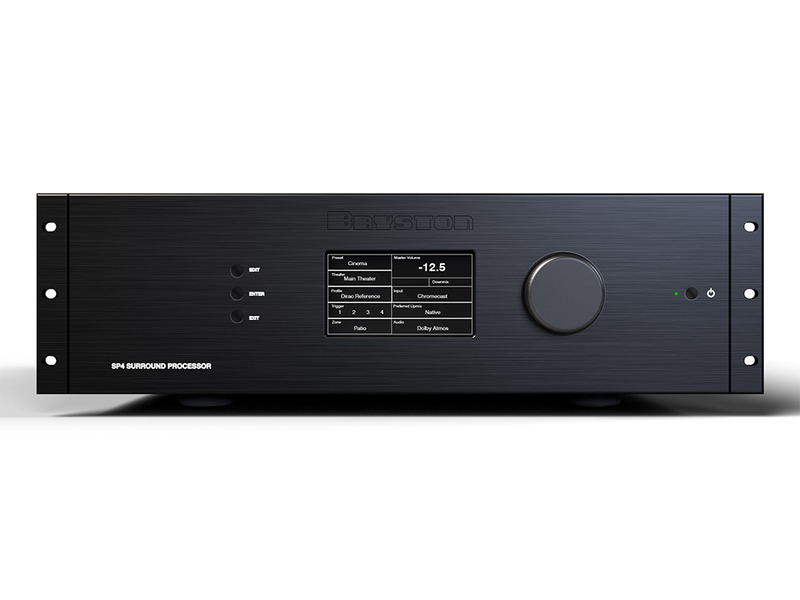 Bryston has just introduced its new SP4 home cinema processor, developing a state-of-the-art preamplifier/processor to match the performance of its amplifiers. Designed to meet the criteria of modern home theater systems, the SP4 offers almost limitless configuration possibilities, along with Dirac room equalization, as well as Dolby Atmos, DTS:X and Auro-3D object-based surround sound. “Bryston wanted to offer a very high-performance surround processor that would be commensurate in quality with our premium amplifiers commonly used in home theater systems around the world,” states Gary Dayton, vice president of sales, Bryston. “Years ago we had developed a model—the SP3—that was the quality benchmark for Dolby Digital and DTS cinemas, but with the advent of Dolby Atmos, DTS:X and object-oriented surround systems, we didn’t have a Bryston processor that would bring the same level of quality to these newer cinema formats that we had with the previous codecs. As part of the company’s design goals with the SP4, Bryston says that its latest home theater solution not only offers today’s object-based surround formats, but it is also firmware and hardware upgradeable. Some of the installation flexibility the SP4 includes a wealth of configuration options. Dayton says the home cinema processor incorporates 16 channels that are assignable in a choice of configurations through a web-based interface. This interface is accessible from computers, as well as smart devices that include Apple iOS products. The web interface also provides assignable options for the processor’s inputs, triggers, surround modes, zones, Dirac Live equalization and more. “Installers need a lot of options when they are doing a setup. We have different levels of login credentials for each type of user. The installer has blanket access to the entire system, with full control over inputs, outputs, triggers; different presets, macros, the whole works,” says Dayton. “As an installer can assign limited access to an expert user, perhaps a facilities manager or somebody who manages technology for the homeowner. But the installer can limit the access he gives to the client, where they can adjust volume, change sources, and make a few tweaks to sound like equalization, change surround modes, etc. The SP4 includes seven HDMI 2.0 inputs all compliant with HDMI 2.0 and two outputs, one with HDCP 2.2 compliance. The processor also includes six S/PDIF inputs and eight analog inputs. A closer look at the processor’s output finds a total of 16 balanced (XLR) that are assignable, plus two more for left and right downmixing options. The SP4 accommodates an optional 16-channel expansion board for a total of 32 outputs for the ability to drive a second theater off of the same processor. On the control side, Bryston is supporting integration professionals with control modules for third-party systems from top manufacturers such as Crestron, Control4, Savant and RTI. The processor also incorporates IR and assignable DC triggers to provide additional control configuration beyond control drivers, and there is a companion iOS app that homeowners can use for additional control interface capabilities. “I think that was is most fascinating about the SP4 is not so much that it is a great product, but that it is an impressive platform for upgradeability in the future,” he emphasizes. Dayton says integrators will need a Dirac Live software license specific to the SP4, along with some type of microphone solution. Bryston also offers frequent training webinars to help integrators familiarize themselves with the SP4’s calibration options. According to Dayton, integrators can use their preferred microphone preamps and calibration microphones if they want, and he says that Bryston also offers calibration kits to support dealers. The Bryston calibration kit comes in a custom pelican case with an individually calibrated USB microphone, as well as a long USB cable, a long cable extension, a desktop tripod and a floorstanding tripod, and a windscreen. “The license and kit are one time purchases for the dealer,” he says.